The poly community has been anxiously following the reality show Polyamory: Married and Dating since it premiered on July 12th on Showtime. Many folks have written posts and reviews of the show. Now, the seven-episode-long season has concluded, the last of the recaps are being written, and the stars of the show are hitting the media circuit. My own view remains that for all the imperfections and humanity of the cast, the show is the best thing that has happened for public understanding of polyamory in ages. 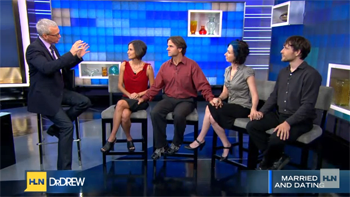 The San Diego quad (Kamala, Michael, Jen, and Tahl) even made an appearance on the Dr. Drew Show, which thankfully didn't go as badly as expected, while two members of the triad, Anthony and Vanessa, were interviewed for the Polyamory Weekly podcast as well as on KPFA public radio. You can follow the show on Facebook and follow the quad on Facebook to keep track of upcoming appearances. It is unknown whether the show will be renewed for a second season.